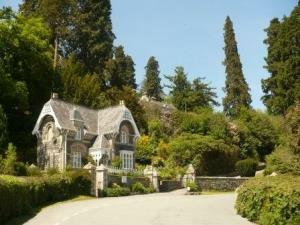 Broneirion Lodge01686 688204work Self-cateringBroneirion Lodge is a beautiful Victorian 2 bedroom stone cottage set just above the River Severn and the village of Llandinam. Sleeping up to 6 it is ideal for families and couples. It is within easy walking distance of the village and country pub, nature reserve, the Severn Way and is a perfect base for exploring the attractions of Mid Wales, Snowdonia, the Brecon Beacons and the coast. The surrounding area offers walking, fishing, sailing, golf, cycling and bird watching and after an energetic day out there are numerous country pubs, serving excellent food. Numerous tourist attractions and activities for all ages include horse riding, indoor play areas/ball pools, sports and outdoor activity centers, swimming pools, castles (Powis Castle, Montgomery and Dolforwyn), stunning scenery – mountains, forests, lakes and waterfalls, farm parks, Red Kite centre, theaters, Center for Alternative Technology, silver & lead mines, bird watching, butterfly farm, Silver Mountain Experience, steam railway, bike hire and, of course pubs, coffee shops and restaurants. The area is used for car and motorbike rallies. Broneirion can offer a number of activities upon request which include archery, geo-catching, bouldering hut, orienteering, bike hire and inflatable assault course and a number of lawn games and sports equipment. The cottage has 2 bedrooms. The double bedroom is beautifully decorated with double bed and plenty of wardrobe space. The master/twin room contains 2 beds which can be zipped together to make a king size double. Both rooms retain original features including a decorative cast iron fire place. There is additional sleeping on the double sofa bed in the second living room. There are two living rooms. One is traditional, with a three piece suite, one of which is a sofa bed. The other living/dining room is decorated in a more modern style with 2 sofas and an armchair. There is a separate dining area with seating for 6. The kitchen is compact but well equipped, comprising of work top space, sink, oven, fridge, microwave, kettle, toaster, pans, crockery, cutlery and utensils for 6 persons. A washing machine is situated in the boiler house next to the back door. Upstairs fully fitted bathroom and wc with shower over. Downstairs fully disabled toilet with wide door for wheelchair access. Country garden with patio chairs and table. Ample private car parking space for up to four cars is located to the side of the cottage. 1 bath and 1 hand towel per person and one set of bed linen are included in the price. Additional items can be arranged upon request. Beach towels are not included. The property is cleaned before arrival and once a week thereafter.